I seem to have acquired the half-joking job-title of ‘business-anarchist’. Huh? Anarchist? You mean like those crazy bomb-throwing guys from the past? Quite a long way from ‘”not quite”, actually. 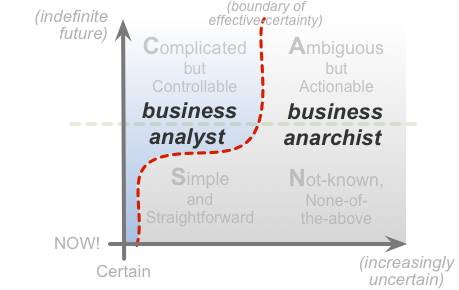 You did notice that word ‘business’, in front of ‘anarchist’, yes? It’s a business discipline. Not, perhaps, a word one might at first associate with ‘anarchist’. But it is, in fact must be, because anarchy’ – literally, ‘without rulers’, or ‘without rules’ – only works well when there’s a lot of careful discipline and self-discipline behind it. At the same time as being open to and dancing with all of the possibilities around us. And all the uncertainties, too. Being open to possibilities and working with uncertainties has a lot of value in business. Which is why, yes, this is a business-discipline. In fact one of the most challenging business-disciplines. Interested? 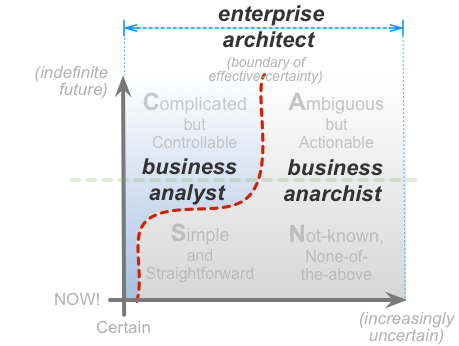 You probably should be, if you’re an enterprise-architect – because even if it’s often ignored, the business-anarchist disciplines are part of the job-description, whether we like it or not… Which is why it might be a good idea to learn about it, and learn how to do it better. Everyone knows about the business-analyst role and discipline. Its focus is to refine, refine, simplify, make everything more efficient – doing things right. Using the rules to refine the rules – that kind of thing. Working mostly inside the boxes. That bit’s important. But as you can see from the SCAN frame above, it only covers some of the context-space. (A lot less of the context-space than many people might purport, by the way.) It works best with ‘tame-problems’, things that stay the same, no matter what the real world throws at them. What I see in ‘the EA trade’ is a lot of people very good ‘left-side’ analytic skills: many of us probably came into the trade via the business-analysis route, after all. Yet I don’t see anything like as much awareness of the ‘right-side’ business-anarchist disciplines; nor of why they’re likewise every bit as crucial to enterprise-architecture. Oh Tom, here we go again — the choice of words. To get right to it, I fear you may come to regret the choice of the word “anarchist”. Yes, one of its denotations is appropriate to the ideas you’re espousing (and it’s NOT your ideas that I’m responding to, I pretty much agree with you, as usual), but as I have so often noted, it’s the connotations that trip us up. And one of the most common connotations of anarchist and anarchy is violent overthrow and destruction (just look at a handful of dictionary definitions), resulting in lack of structure and order, i.e., chaos. But no matter how much we protest that we are using a word to mean some specific thing, most people will still hear (and internalize) what the word connotes for them, not what it denotes for us. Indeed, most people will not hear the “I’m using this word to mean this” qualification, because they first have to get past their assumption that they already know what you mean by anarchist before they can attend to your explanation. Agree that about uncertainty and difficulty in planning for it, however operational roles need to focus on the actionable near term. Strategic business risk is more the accountability of the Board, and hopefully they are not just betting on the one scenario they think most likely but creating strategic options which enable the business to flexibly adapt as probabilities change. Such strategies could involve partnerships or minority equity positions in companies in adjacent industries. It would be interesting to discuss how EA could take this into account .. Perhaps it is the opportunity to highlight Nd improve flexibility in processes and systems such that they can adapt more cost effectively in an environment of fluid value chains and M&A activity. In everyday practice of course you’re right. 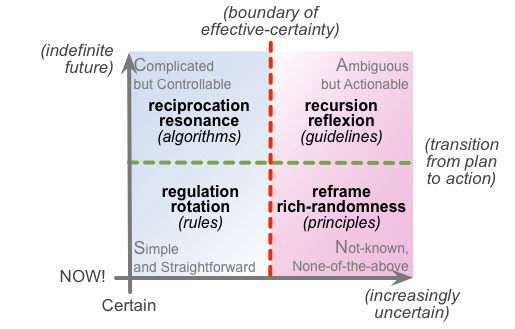 It has struck me, however, that the presentations I give that get the most discussion and enthusiasm are those that address the ‘right-side’ – about uncertainty as an attribute of the real world and not something to be eliminated, about emergence and creativity and about the myth of control. It seems this connects with a lot of people. They find it hard, however, to bring it into their daily work, where expectations of predictability and control are put upon them. Let’s keep helping those people. The rest will either eventually get it or they won’t. Very strong agree on all of that, Stuart – many thanks for that. And yes, “Let’s keep helping those people”, wherever we can. The mistake I’m making, though – and I still don’t know how to get the other side of it – is that the one person I’m probably not helping at all is me… 🙁 In a financial sense, obviously, but in too many other senses as well. It’s getting closer and closer to the point where I really won’t be able to afford (in any sense) to do this any more, unless I can change things somehow – and as yet I have no idea how I could do that. Oh well.